I wanted to share with you a Field Report from one of our rescuers at CLAW (Community Led Animal Welfare) in Johannesburg. Themba Buthelezi, a long time dedicated employee of CLAW, undertakes all CLAW’s door-to-door work, addressing cruelty and neglect cases. He received an Animal Action Education Award from IFAW a few months ago to acknowledge his incredible commitment. 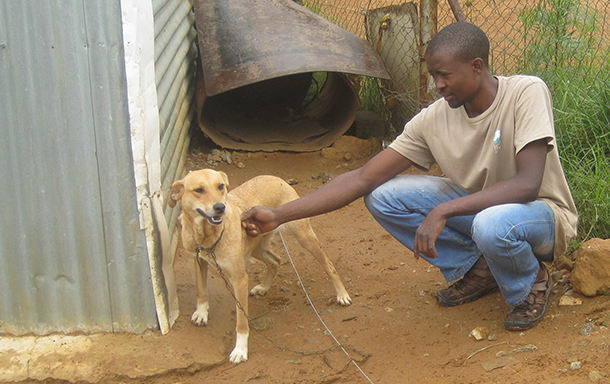 Themba, who grew up in the communities in which CLAW works, understands the hardships faced by people and their companion animals in the townships. The fact that he started working at CLAW at a young age means that he is also well placed to make judgement calls, addressing each case on an individual basis. This is evident in the many lives he has changed and saved, as reported by Cora and her extended team, which led to him receiving the award. Case #1: Fistos, mongrel in Braamfischerville. I met Fistos the male mongrel on a cold rainy day on 25th February 2014 during my house to house inspections in Braamfischerville township. He was living in appalling conditions. He did not have proper shelter; he was on very short chain; he could not move from one point to the other; and he was without food and water. I spoke to the Owner who happened to be an old granny, living alone. RELATED: Read about CLAW volunteer, Kganya Lephalletse, another winner of South Africa’s Animal Action Award. In conversation with her I learned she chained the dog because her yard is not properly fenced and she feared the dog will wander to neighbours yards and cause trouble by messing or attacking chickens. When I spoke about why Fistos did not have food or water, she told me she has been ill for 2 days. She appeared to love her dog very much. I promised to visit her the following day and I temporarily took Fistos to CLAW just until the shelter is fixed. The following day 26th February I went and put up the running wire. The old lady was very happy. In 3 weeks I revisited the place, and the shelter was fixed even though it was still not perfect. I returned Fistos and a month later CLAW donated a kennel. I regularly go and check on Fistos and he is a very happy dog. 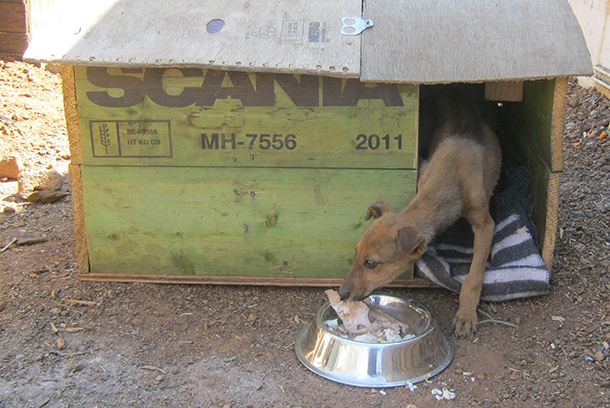 He was also living in very bad conditions without shelter and on short chain. After my intervention Danger is today living freely with a proper shelter. Learn more about the CLAW project's important animal welfare work, visit our campaign page.